Equipped with spotlight, heating/air-conditioning and PA system, our recital hall of maximum crowd capacity of 120 has been the venue of choice for many recitals, concerts and master classes to local teachers, performers and musical groups and is one of the best maintained and most affordable recital halls in the City of Markham and across the region. To ensure the highest quality in piano tune, a 9′ Steinway D Concert Grand piano is placed on stage for recitals and concerts. This exceptional piano creates a dynamic match in harmony and exudes an elegance in piano craftsmanship. 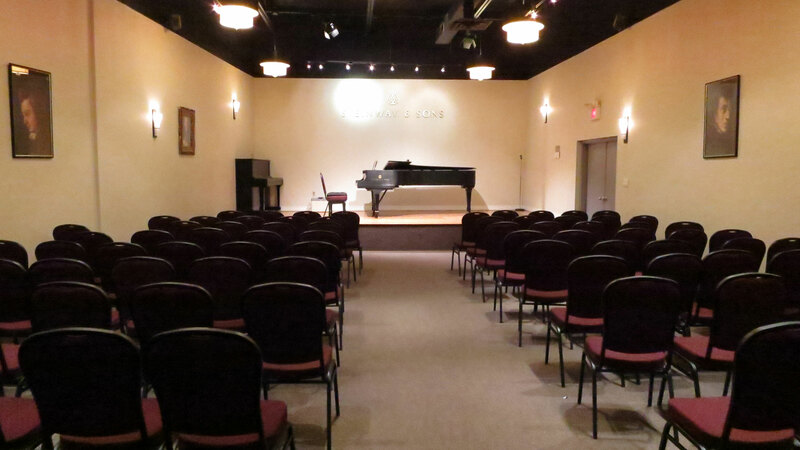 Located right in the heart of the City of Markham, hosts and attendees alike are constantly surprised and impressed by the elegance and capacity of our recital hall. Whether it is a master class or teachers recital, our recital hall will meet every aspect of your requirement. For a better look and appreciation of our amazing facilities, we invite you to visit us in person any time during our normal business hours so you can experience the unique elegant feel of our hall. For booking, please contact us at (905) 475-3876. **Please contact us at 905-475-3876 for special discount rates and details for piano teachers.